2- The text is going out to backers in sections during the KS. This is a by-product of having the words all written: we can share them with our backers. We prefer to do this is sections throughout the KS so there’s always new stuff to talk about, as opposed to one big info dump. This also lets our backers know that we trust them, and by seeing what we’re going to publish backers can bail before the end of the KS if the book isn’t what they were looking for. No unpleasant surprises. 3- The Reward Tiers don’t delay the book itself. One of the other big factors in delayed rewards have been added material due to Reward Tiers and Stretch Goals that add material directly to the book being Kickstarted. We don’t include those things unless for very specific and controlled reasons anymore. We now create Companion projects where we can add new sections during the course of the KS and concentrate effort on them after the KS’d book is rolling along. 4- Shipping costs are included in the KS set-up and are realistic for current shipping charges. This is not one of the cool parts of Kickstarting projects, but shipping costs have risen just this year, and we want you to know right as you pledge what costs will be added to your base pledge. Similarly, paper costs have risen dramatically and have been passed on to us by our printer, so the physical book pledge had to rise a bit, too. 5- This is a Deluxe Edition, to go with EX3 and Dragon-Blooded. So the sales chain on this will be PDFs and physical book PoDs on DTRPG, and Deluxes to backers and IPR, rather than to Studio2 for release into stores. 6- Expanded media coverage. In addition to the opening vid that we put up with each Kickstarter, our expanded use of other media to explain our games means that there will be links provided throughout the KS to delve further into what the Lunars are all about. For example, Matthew Dawkins and Neall Raemonn Price will be presenting a Lunars character creation session using the new book. 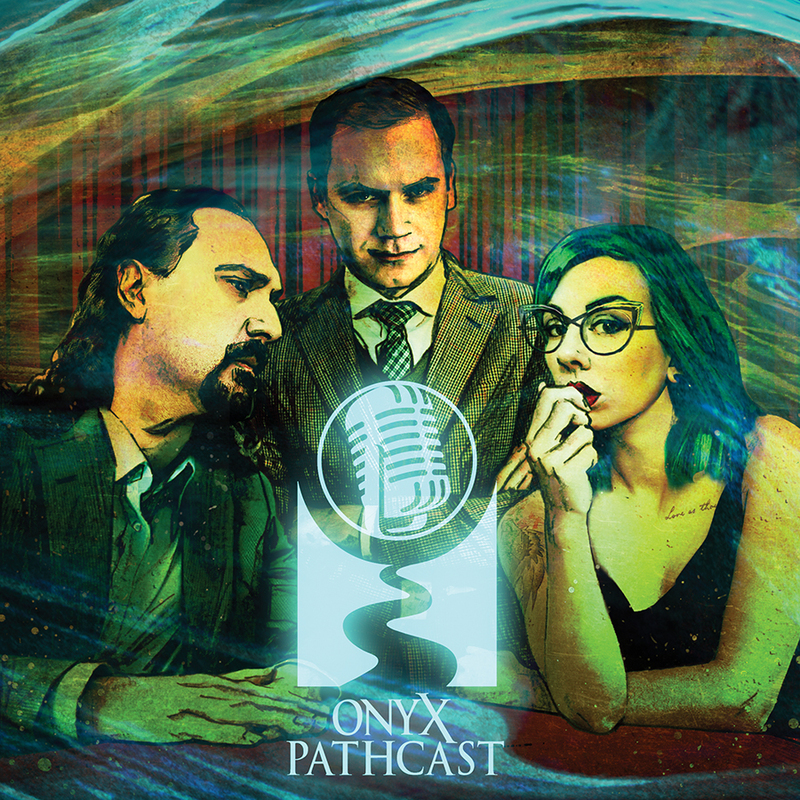 We will also be appearing at other cons either as Onyx Path or as individual creators, and I’ll get that list going next week below in the Blurbs! 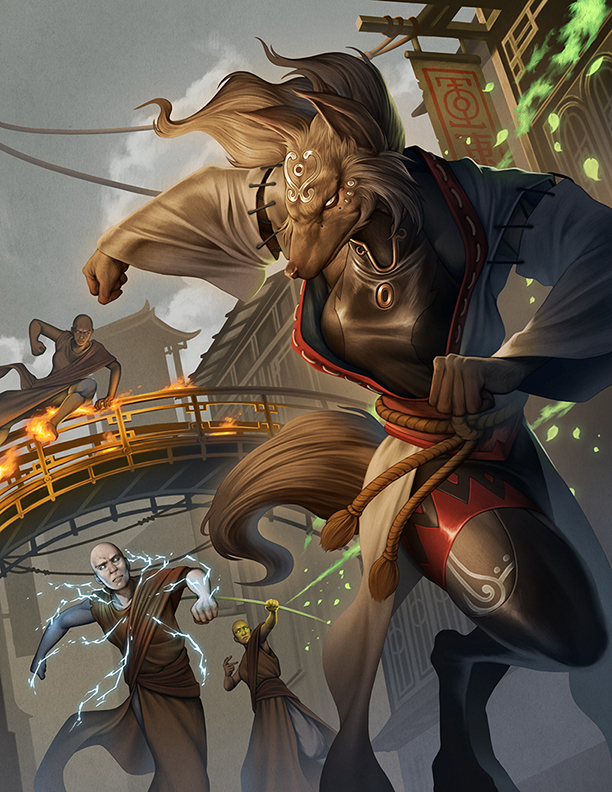 One thing we are doing differently is that we’re changing how we do Gen Con this year, because we really want to emphasize demos and play opportunities with all of our many game lines. I’ll go into the details as things firm up, but what we are sure of is that you’ll still be able to buy our books at the IPR and Studio2 booths, that a bunch of us will still be doing panels, and that our demo area is going to be greatly increased. NEXT UP! 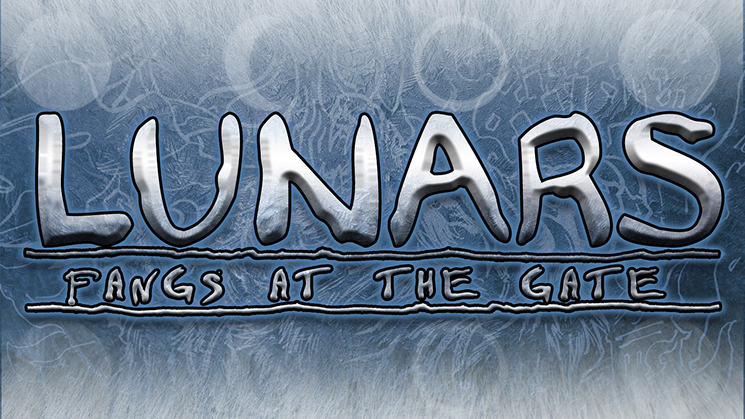 We’ll be starting the Kickstarter for the Deluxe version of EX3‘s Lunars on this Tuesday February 12th at 2pm Eastern US time – so don your beast forms and let loose a howl (or snarl or squawk or hiss) to let everyone know it’s coming! On Saturday we uploaded the third part of the excellent actual play of They Came from Beneath the Sea! run by Matthew Dawkins for Red Moon Roleplaying. Here’s a link to the video: https://youtu.be/szxFe7vvBnE Things are getting incredibly creepy in the town of Denton, Alabama, as people are melting into gunge! And here’s something exciting! Matthew Dawkins will be on our YouTube channel later this week to discuss Werewolf: The Forsaken with frequent Werewolf writer, Chris Allen. Chris also acted as one of the three chaps sharing the developer seat on Shunned by the Moon. Chris and Matthew will be discussing the content of the comments left on this video: https://youtu.be/2my21NosubI and we encourage you to leave comments too! 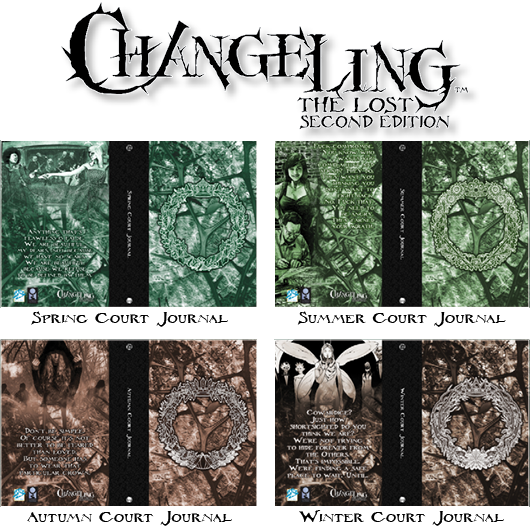 This Wednesday, we’re releasing Changeling: The Lost 2e Condition Cards on DTRPG, and CtL 2e Blank Journals are going on sale on our Onyx Path Redbubble store! EX3 Lunars – Assets finalized for KS page. In Media Res – Headshots all in, and rest of the finals coming in. Shunned By the Moon – All artists contracted. Book of Oblivion – Sketches coming in slowly but surely. Scion Hero – Putting printer files together, sending to press this week. Scion Origin – Putting printer files together, sending to press this week. M20: Gods and Monsters – Gathering backer errata. Pugmire Roll of Good Dogs and Cats – Gathering backer errata. False Images – EX3 novel – Gathering backer errata. Wraith 20th – Shipping to KS backers. Wraith 20 Screen – Shipping to KS backers. 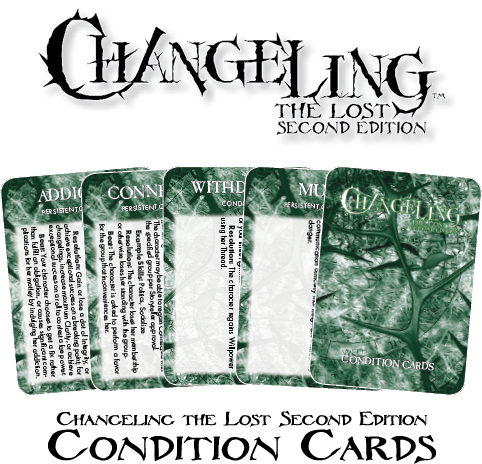 CtL2e Condition Cards – On sale this week. 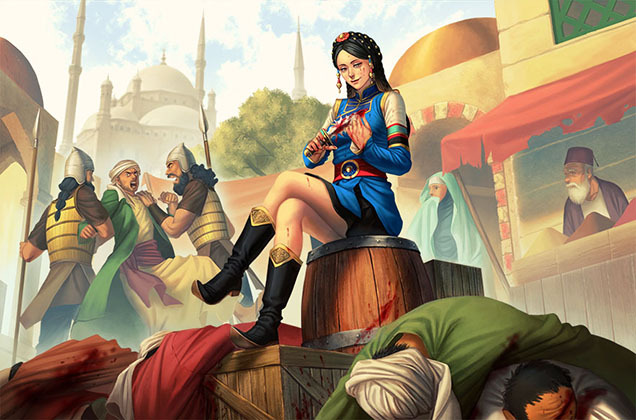 Later this week – it’s human heart trading day! Happy Valentine’s Day, ya’ll! ◀ Episode 38: The Prolific John Snead! > Scion Hero – Putting printer files together, sending to press this week. > Scion Origin – Putting printer files together, sending to press this week. And so grateful for what you’re changing and your Kickstarters. Waiting for these things to be done has indeed become quite tiresome, though I understand how the delay came about. I think I’m up to twenty updates on Backerkit, just changing my addons over and over. The extra time was not wasted! Regarding delays for KickStarters, I have never felt left in the cold by any of your delays. Most notably Ex3 and Wraith20, both took forever to get, but when they dropped? The wait was 100% worth it. I know that there were different things delaying each of those, but you kept us up to date and didn’t make us – well, most of us – feel like you weren’t going to deliver. The other thing is shipping costs. My 4 lbs of V5 prepordered slipcase three-book dealie arrived at my middle-America home from England, and for the outrageous cost of shipping I feel like I paid, I’m fairly embarrassed to tell them that it arrived damaged. Now I kinda know how the non-US KS backers maybe feel, and it’s rough. I know you do your best, of course, and you really do well. That’s what I’m saying. Why should you feel embarrassed to let them know that your shipment was damaged. You paid Modiphius a lot of money for those books and that slip case – if it arrived damage you should not hesitate to let them know. Modiphius is pretty good about issues like this (I had a damaged Star Trek Adventures Core) – though not as good as the group that chased after bad copies of the POD copies of V20 until they got it perfect. I can’t wait for Kith and Kin to give more options for CtL 2e, which is just fantastic. What is the approximate timescale from First Draft to availability? Will we see any previews before then? Errata takes as long as it takes. Then the developer has to review the errata, incorporate it, and then we slot it into the queue for release. Any way we can know what the pledge options will be for the kickstarter so we can plan things before it goes live? My Wraith 20 should be arriving today, according to the fine folks at the USPS. Woo! Mine arrived yesterday! So happy. Any chance you’ll start coming to any Texas based cons? Like, PAX South, A-Kon, Animefest, Dallas Comic Con? 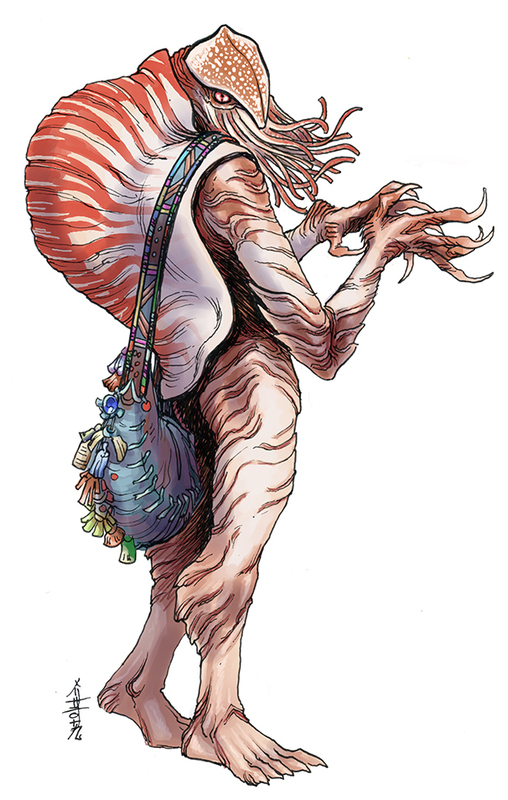 That anthro nautilus artwork is absolutely fantastic. Does proofing mean we’ll see the c20 pg soon? Hope so. I’m really looking forward to that one getting out into the wild! 😀 I have so much anticipation for this text. Masks of the Mythos showed up on the boards quickly…. I’m more interested in Dragon but I’m never disappointed to see anything Scion related. Will Scion Hero and gods and Monsters be POD on DTRPG?? Waiting for Signs of Sorcery to expand my mind. I went all-in on Lunars, Scion, and every other KS. But SoS…my preciousssss! Glad to see it’s on track!